“Hollywood Hates This Book: The 7 Step Guide To Making Your Film For Free” is Andy Wilton’s NEW comprehensive book on how to make a brilliant independent film, regardless of background, budget or resources; even for FREE. Andy takes you hand-by-hand through every stage of the filmmaking process; from turning your idea into a script, planning your film, shooting it, editing, mastering and distributing it. The book is written to be extremely in-depth, but engaging and suitable for both beginners and advanced filmmakers; anybody looking to make a feature film. 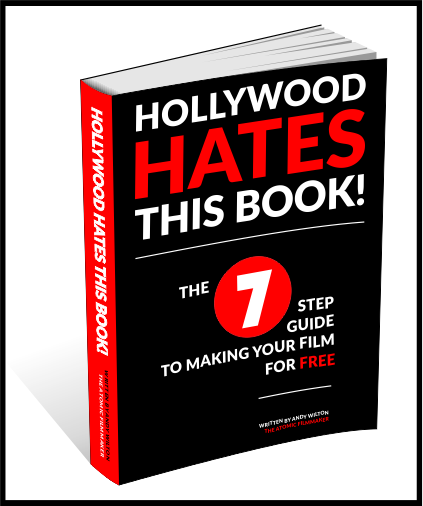 “Hollywood Hates This Book” even comes with FREE trial membership of the “Production Posse“, Andy’s online filmmaking community and resource site. It’s a base to collaborate and engage with other independent filmmakers and creatives. The book features a foreword from Hollywood indie-film legend Carlos Gallardo (El Mariachi, Desperado, Once upon a Time in Mexico, Planet Terror). Speaking about the book, Carlos says: “I hope you’ll enjoy reading it, learn a lot and are inspired to go make your film”. Visit The Official “Hollywood Hates This Book” Website! “This book will tell you in 7 steps, not only how to make a film, but how to fully realise a GREAT one.